11.27.030 Industrial flex transitional overlay standards. A. Allow existing businesses within the overlay to operate and allows additional manufacturing uses within the overlay. B. Implement the general plan mobility element policies to utilize rail, which would reduce truck traffic along Firestone Boulevard. C. Provide for standards to ensure the vision of the general plan is implemented and the proper transition between existing adjacent land uses occur. The standards of this chapter may be used by and applied to any property identified within the industrial flex transitional overlay, as shown in Figure 11.27-1, Industrial Flex Transitional Overlay Map. 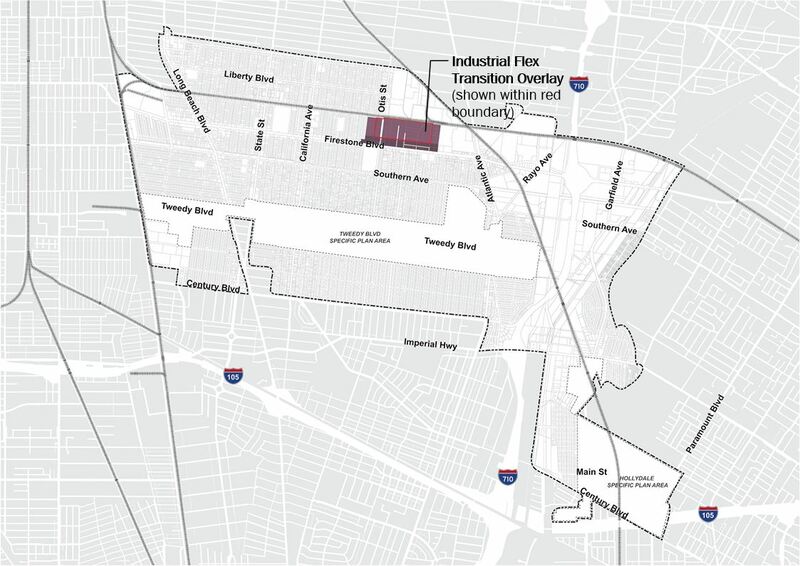 The industrial flex transitional overlay is intended to be used on an interim basis until properties within the overlay area begin to redevelop to urban mixed uses. Once a property located within the overlay redevelops to a nonmanufacturing use, the overlay shall no longer be applicable to that property, in whole or part. A. Development projects in the industrial flex transitional overlay shall be subject to the development standards of the zone, as described in Section 11.22.060, Industrial flex zone (IF). B. Permitted manufacturing uses shall be limited to general manufacturing and assembly identified in Chapter 11.60, Definitions, as well as select light manufacturing uses as described in Table 11.21-3, Allowed Land Uses, Urban Mixed-Use Zones. C. The following development standards for FAR and height shall apply to parcels within the industrial flex transitional overlay. For other standards not listed below, standards listed in Table 11.22-IF, Development Standards, shall apply. D. Screening of outdoor uses is required as identified in Section 11.24.050 so that uses are not visible from the public view or streets. E. Development projects shall be subject to the buffer setback requirements as identified in Section 11.30.050(E). F. Where feasible, manufacturing uses should consider rail use to transport goods. 1. Nonmanufacturing uses, such as ground-floor retail, service-oriented business uses, restaurants, cafés, and other uses that generate walk-in clientele, are required within with the Firestone pedestrian frontage overlay. 2. The location of manufacturing uses shall be limited to the boundaries of the industrial flex transitional overlay only. 3. Development projects shall ensure proper interface and compatibility with the adjacent Firestone pedestrian frontage overlay in terms of site layout, architecture, pedestrian orientation, and on-site circulation. H. Development projects shall comply with the design and development standards for the industrial flex zone, as contained in Chapter 11.22, Urban Mixed-Use Zones, and Chapter 11.23, Development and Design Standards and Guidelines. Additionally, standards of Chapter 11.30, General Property Standards, and all other applicable requirements of this title, shall apply. I. See special requirements and overlay zones map for the location of other applicable overlays, including the Firestone pedestrian frontage overlay, Firestone and Otis mixed-use area, and Union Pacific Railroad overlay.